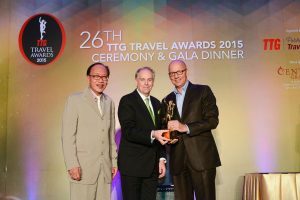 Shanghai, China, December 9, 2015 /ChinaNewswire.com/ - Voted on by readers of the TTG stable of trade magazines, the award is presented on the basis of the “most consistent product and services and the most professional sales and marketing teams in terms of innovation and servicing” and clearly establishes AccorHotels amongst the very best in the business. The signature Hermès trophy was presented during a Gala Dinner in Bangkok. The Best Global Hotel Chain award will be displayed alongside the group’s award for Best Budget Hotel Brand for ibis from last year’s ceremony. AccorHotels is the leading hotel operator in the world with 3,800 hotels across 92 countries, and globally renowned brands including Sofitel, Pullman, MGallery, Grand Mercure, The Sebel, Novotel, Suite Novotel, Mercure, Mama Shelter, Adagio, ibis, ibis Styles, ibis budget, adagio access and hotelF1.